Take a look at this chandelier. My soft spot is for items that say style, prestige, antique and class altogether. This unique piece says it all and then some. When you walk into a room, any room, you immediately feel a certain vibe. This vibe could be created by the people in the room or by different furniture, pictures and lightning. Imagine yourself walking into a room where this exquisite chandelier is hanging, spreading its glorious light and brightening the entire room. Imagine the amazing vibe created in that room. Rows of crystal beads fill the channels of the narrow ribs that make up the bottom of this enchanting chandelier, while bouquets of cut crystals spill over the edges. 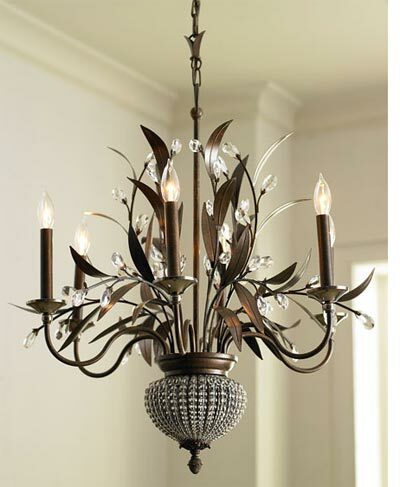 Iron framed, requires eight candelabra base 60-watt bulbs with ceiling canopy included. 27″Dia. x 33″T with 5′ chain. Sometimes, a room is missing something, but we don’t quite know what it is exactly. Most of us think of another piece of furniture. Here is a little secret – most of the time all a room needs is a shimmering light – Crystal clear.